In this episode of the eLife podcast we hear about cancer, dengue fever, sperm DNA and neurons that are sensitive to magnetic fields. How do some animals navigate the world without maps? 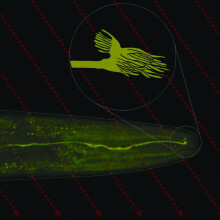 A neuron in worms has been discovered that can detect the earth's magnetic field. It's been known for a very long time that many organisms are sensitive to the Earth's magnetic field. Birds, fish, bats, and even bacteria use the field as a reference to find their way around. But how the magnetic field is detected has remained a mystery. But now, thanks to a fridge magnet, Jonathan Pierce-Shimomura has found that worms also do this and he's uncovered a pair of unusually shaped nerve cells inside the animals that appear to work like a neurological compass. Jonathan - There are all these animals that migrate around the world using the Earth's magnetic field. But it's been a real mystery about how they sense the Earth's magnetic field. We don't have this sense. So, we don't have any intuition how they do it. No one has ever discovered neurons that are actually required for these migrations or actually sense the Earth's magnetic field. Chris - And you've been looking in worms at this. So, they presumably do this, too? Jonathan - Yeah. It wasn't obvious that tiny microscopic worms would do this. But my lab makes a business out of studying how they migrate to different stimuli and perform other behaviours. We thought, "Let's see if they move towards magnets?" So one day, we put a refrigerator magnet on one side of the dish and we saw that worms would migrate towards this. That was our first hint that they might sense magnetic fields. To determine if they could sense the Earth's magnetic field, we next injected them into a tube filled with Jell-O. When we did that, we found that, starved worms had a preference for burrowing downward in the tube. When they were well-fed however, they liked to burrow upward. This suggested that they might use gravity or the Earth's magnetic field to orient. To figure out if it's gravity or the magnetic field, we put the same tube inside of a coil where we could invert their Earth's magnetic field, flipping it now upward instead of downward. When we did this, worms moved in the opposite direction. Chris - If you, therefore, take worms from a part of the Earth's surface where actually the magnetic field is going in the opposite direction. So, I'm thinking if you're in the northern hemisphere and you're working on worms from the northern hemisphere, and you compare them with worms from the southern hemisphere. Do they do the opposite? Jonathan - Yes. That's indeed what we found. We took worms from Australia and we tested them in the same experiment, and they moved in the opposite direction. When they were starved, they liked to burrow upward. When they were well-fed, they liked to burrow downward. So, this is consistent, not with gravity, but with them responding them to the natural direction of the magnetic field where they come from on Earth. Chris - Is it that the worms are detecting the magnetic field or are they sensitive to something that the magnetic field does to the tube they're living in? Jonathan - To ask that question, we try to identify the neurons that might be required for performing this behaviour. So we systematically broke a bunch of the different sensory neurons with different mutations. And we quickly deduced that one pair of sensory neurons called AFD were required for this behaviour. Chris - Ah right. 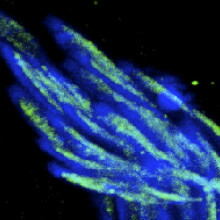 So, there's a specific magnetic sensing pair of nerve cells in these worms. And if you deactivate them, then the worms can't do this. Jonathan - That's right. They couldn't move towards the refrigerator magnet, nor could they show any preference for burrowing up or down like the normal worms could. Chris - But are those nerve cells detecting the Earth's magnetic field, or are they detecting something that the Earth's magnetic field does to the environment? Jonathan - Looks like these neurons detect the magnetic field directly. Because when we performed a physiological experiment to see if the neurons could be activated by magnetic fields, we saw that the neurons were turned on when we introduced a magnetic field that was Earth's strength. So, this neuron responds directly to the Earth's magnetic field. Chris - Do you have any insight into how that nerve cell is registering the orientation of the magnetic field relative to it, so the worm effectively has this built-in compass. How is this working? Jonathan - This neuron has a very intriguing shape. The tip of it has these microscopic antenna-shaped structures with the antenna pointed towards the front and towards the back of the animal. This shape would be really nice to serve as a miniature compass that can wiggle back and forth, perhaps if associated with iron, that could activate the neuron and tell them which direction they're going. Chris - Do you think that this is an insight, what this worm's doing into how bigger, more complicated creatures like birds or butterflies, or turtles, salmon, for example, all of which migrate, we think, following the Earth's magnetic field actually achieve that feat? Jonathan - It remains to be seen if the same sort of mechanism will be used in these larger animals. But this is a nice new clue about how animals can sense the Earth's magnetic field. What we're hoping is that the molecules that we find that are required for transducing the Earth's magnetic signal into an electrical-chemical signal in the neurons - once we identify those molecules, we can see if those molecules are in the sensory organs of birds, turtles, and butterflies. Cancer is caused by gene mutation but how much is too much and could increasing mutations lead to new treatments? William - These mutations typically happen in specific sets of genes that then are known to cause cancer development. Although these genes are typically seen to be mutated or disrupted in cancer, there's often only one of these mutations in each cancer type. So, there's often not more than one happening together. And our big question was, well why does this occur? Why do cancers only have one mutation and not others? The typical thought has always been that, well the cancers don't need more than one. They only need one of these genes to be mutated in order to cause cancer. So, there is no selection or pressures involved in order to select for both mutations happening at the same time. Chris - But equally, there's no selection for not having both, is there? So, you ought to see by chance, some cells that do have both if all things are equal. William - So, exactly. That was our point. We looked at over 600 tumours from patients with lung cancer and that's what we were looking for; is any evidence that these two mutations co-occur, happen in the same cell. And we found no evidence of this as the case. Chris - Do you think this is just a deleterious thing that one being mutated is good for the cancer? Because it drives the cancer, but get both going down, now it's a case of overkill. Or do you think there's something else going on? In other words, when you go looking, you don't see them because any cells that have both didn't last long enough for you to detect them? William - That could be the case. We thought there could be some technical issues involved here, but our main theory was that maybe these aren't occurring in the same cell because they actually have some deleterious effect or they actually somehow kill cancer cells that have both these mutations. So, there's a pressure against having both of these genes mutated and that's what we set out to test in this paper. So, we actually have mice that we can engineer to express these mutated genes, specifically in the lung. And these mice, with one of these genes, always get cancer at a specific time points in their life. And what we did is now we engineered the mice to force the expression of both these genes at the same time, and we predicted that if our hypothesis was true, that this would mean that if there was a negative effect of having both genes that we would see an effect on when these mice got tumours. But what we found was that they still got cancer and they still got cancer at the very same time as they do with either gene alone. Chris - It's not just the system's a bit leaky and it works for one gene, but not for the other sometimes and that's enough to drive a few tumours. William - No. We figured that it was, at the beginning at least, expressing both these genes. But when we actually took the tumours out of these mice later on, and actually looked to see if both these genes were expressed, we found that only one of the two was expressed. 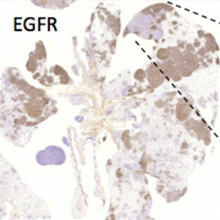 We actually think that there is a selective pressure that these tumours get around having both expression of both these genes and select for just one. So, they're actively actually silencing one of the two mutated genes. Chris - Why are they doing that? William - Well. We think that it's obviously the deleterious effects of having both these genes. So, we think that having two of these things on at the same time actually causes too much growth and proliferation that is actually deleterious to cancer development. So, they just can't really cope with having both these mutations at the same time. So, we think that what they're doing is that they're actually silencing one of the two, which is then sufficient in order to cause cancer. Chris - Why do you think that, given that cancer is a genetic instability and that cells that are cancerous are shot full of genetic changes all over the place. Why don't they end up with some sort of compensatory mutation somewhere else in the genome that quenches one of the two damaged oncogenes? So, that the cell can tolerate having both on, it's just that it's dampening down the effect of one of them with a compensatory change elsewhere. William - It's a really good point. I guess the big thing is we have to remember that this is an evolutionary process. So, in order to, and with selective pressures involved, and this all depends on the order of events, so if you had one mutation in one gene first and then you got the second oncogene mutation. Typically, that cell would die and there'd be no chance for there to be another selective event involved. So, it would all have to occur in random chance. So, you'd have to have that compensatory mutation before you required the second oncogene mutation which would lower the chances of that being the case. Chris - Do you think you can exploit what you've found? That we might be able to tap into this as way, actually, of making cancers kill themselves? William - Yes, that's what the most exciting part is, I think, for our future experiments. Is now utilising this knowledge that we have about how we can hyperload cancer cells in order to design therapeutic stratergies. So what we're looking at now is that most therapies out there are typically based on inhibiting a pathway. So these are based on drugs, for example, that shut down mutated oncogenes for example. But now we're actually looking at things that perhaps stimulate signalling in the context of a specific oncogene what we would call more agonistsic therapies. So in this context we'd actually be looking for things that stimulate signalling to a threshold level where then the cells would die. For the egg and sperm to combine their DNA they first both have to be in the same format, but what is the sperm's role in this? When a sperm and an egg combine, the genetic material from two parents merges. But the DNA in the two is initially in completely different states and it needs to be reset to make the two sets of chromosomes compatible so that cell division can occur. Factors contributed to this process by the egg are reasonably well known but nothing is understood about the paternal contribution. Now, working with Drosophila, Mia Levine has discovered a gene called HP1E which is active only during sperm development but seems to alter sperm DNA in a fashion that's crucial for subsequent successful cell division. Mia - During the process of sperm development, the nuclear volume decreases over two hundred fold. The DNA takes on a highly compact form to fit into that tiny sperm head. And so, if you don't have the proteins that mom produces to transform dad's DNA into a usable form, effectively you get inside the egg a bright dot which represents a highly compact form of dad's DNA that simply can't participate in the later cell divisions. Chris - And this is because, obviously, when you want mitosis, a cell to start dividing symmetrically to make two daughter cells that are genetically identical to each other, you've got to have recognition of which chromosome goes with which from each parent in order for that process to happen properly. And if the DNAs are in incompatible formats, then they're not going to partition properly, are they? Mia - That's exactly correct. And so, dad's DNA gets dumped into the sperm in a very different confirmation than what mom's DNA looks like during that fertilization event, until they independently have to reorganize to come together into similar confirmations before that division can happen. Chris - So, how do you dissect away what the contribution of the sperm might be to getting that DNA into the right format from what the maternal egg processes are doing? Mia - We discovered a gene which we called HP1E, which is exclusively expressed in testes. And so by depleting this protein during sperm development and letting dad's sperm actually fertilize the egg, we're able to actually remove the contribution of that protein. Chris - And what's the consequence? Mia - The sperm enters the egg. The first defect that we see is during the process of condensation. And we see that dad's DNA fails to go through this condensation process. So, effectively, mom's DNA is continuing through its typical series of events but dad's DNA can't seem to "catch up". Chris - How does the sperm do that? Does it bring that protein that was on during spermatogenesis in with the sperm or is the gene just very active in the sperm from the get go in the egg and that provides the protein. Mia - Right. So, that was the particularly interesting piece of the story. There is another protein known in drosophila called, KD1, which actually travels with the sperm DNA into the embryo and putatively carries out its function in the egg. HP1E, instead, seems to be active exclusively during sperm development, is then lost from the DNA. And the DNA itself seems to be flagged or there's some kind of modification of which we have yet to identify that affects its function in the egg. So, we both saw the disappearance of HP1E during sperm development which supports its lack of role during DNA remodeling in the egg. And we also induced mom to make HP1E, which she usually does not, and have her dump HP1E into the egg. And we found that even when HP1E was present in the egg through mom, we were unable to rescue normal divisions. These data, in combination, support the idea that HP1E acts exclusively in dad during sperm development but not during the time when we actually see the defect occur in the egg. Chris - Have you any idea at all what the identity of that manipulation of the sperm DNA must be in order to put it into that resistant state that you then can't get it back? Mia - At this point, we can only speculate. There has been a surge of research done in the past decade or two to look at what else sperm is carrying besides dad's DNA that is inherited into the egg. And we know now that dad also deposits some small RNAs - messenger RNAs - into the egg. And so, the jury is out as to what HP1E does to the sperm DNA to modify it in such a way that allows it participate in nuclear divisions. However, my lab at the University of Pennsylvania will be actively investigating this question. Mosquitoes are becoming an increasing problem with the spread of disease, but in order to tackle them we first need to know where they are. There are now more than 7 billion of us on Earth, and we're more mobile and living in higher densities than we ever have previously. Together with climate change, this is creating novel niches for diseases and the vectors that transport them. Two viruses, dengue and chikungunya, which both cause symptoms of fever, prostration, and arthritis, and can be fatal, appear to be becoming significantly more common and widespread. They're transmitted by two strains of Aedes mosquito - Aedes aegypti and Aedes albopictus. But our knowledge of where these mosquitoes are and how they're spreading is limited, which makes monitoring, anticipating, and controlling outbreaks of these diseases much more difficult. 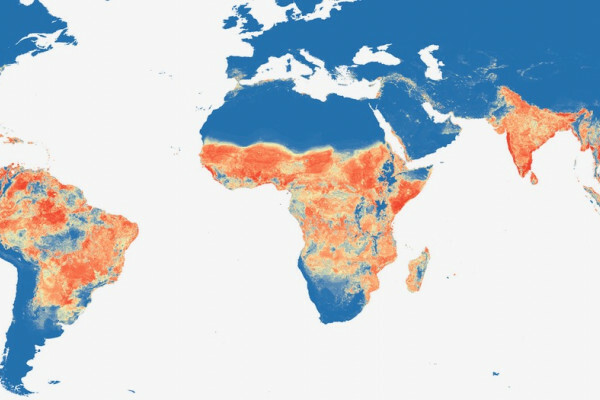 Coming to the rescue is Oxford University's Moritz Kraemer who's pulled together data from across the world to produce the first global distribution map for these mosquitoes. Moritz - So, the context of this study was largely to identify areas where we have mosquitoes that are transmitting two viruses that are of global concern. These two viruses are dengue fever and chikungunya fever, and the mosquitoes that primarily transmit them are Aedes aegypti and Aedes albopictus. Both of these viruses are now sort of increasing their geographical spread but also their numbers and overall health burden on the population. Chris - What about the sources of both of these agents? If we wind the clock back, when did the first really rise prominence and begin to be a problem? And how rapid is the trajectory of spread? Moritz - Initially, of these two viruses, one chikungunya emerged in Tanzania, it was sort of the first report, and dengue in Asia. But only over the past sort of like 20 - 30 years they actually became a big public health problem, and there was an estimate of 2013 where we have estimated that 100 million apparent infections happen every year. 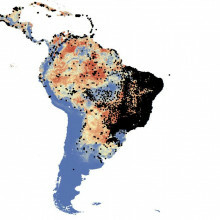 For dengue fever and for chikungunya, we actually don't even have these numbers on a global scale, but here in 2014, 1 million infections were recorded in the Americas alone. Chris - And why do we think this is happening? Obviously, we need the mosquitoes there, but mosquitoes have been around for millions of years, as have our human ancestors. So, why is this happening now? Moritz - So, a lot of people have hypothesized, and we sort of assume that as well, that human mobility and also the increased mobility of trade behaviour between countries has sort of amplified that. Mosquitoes are spread in used tires where they are transported from one place to another, and this happens a lot now between Asian countries, for example, and Europe, and also Asian countries and the United States where there's a lot of economic relations. On the other hand, we do fly a lot more, we do travel a lot more as humans and people go on vacation to certain places. We introduce the virus once we get infected. And then, plus the mosquito might be there. In Italy for example, there was this case of this Indian traveller who came back and then infected 200 people with chikungunya. Chris - So, it all comes down to population dynamics, overall population overland movement, doesn't it? How have you sought to try and map where the mosquitoes are going? Moritz - For getting the data together, we started just sort of understanding, okay, what is information given out in the published literature? So, we did a whole lot of research just trying to find out, okay, how many papers are there discussing these mosquitoes and discussing them specifically with the information of the geography of these mosquitoes. So, we did a whole lot of research and downloaded all these papers and had four people working on it full-time trying to understand where do we find these mosquitoes. And we wanted that on a high spatial resolution because we wanted to map it on 5 kilometre by 5 kilometre spatial scale. Chris - You're nonetheless relying on other people's data for this, aren't you? So, there must be gaps. Because if they haven't looked in an area, you won't have anything to go on for that particular geography. Moritz - Right. So, what we also did was contact a lot of health officials from different countries. This included the ECDC, the European Centre of Disease Control, but also the Taiwan CDC, Brazil for example, and Indonesia, and tried to find out what kind of information they actually collect on a daily basis. Because dengue and chikungunya have been a problem there for quite a long time now. So, we sort of gathered that data together and put them into our database and made them all work together in this database, and then put them into our model. Chris - Were there any pointers towards, perhaps, novel ways that we might consider mitigating or controlling the spread, either of the mosquitoes or the disease, and any other surprises in here. Things that you really were quite shocked to see in the data. Moritz - We haven't specifically actually looked at any sort of control measurements that were put in place. Our understanding here, like our approach here was trying to find out, okay, what is actually the global distribution of these two mosquitoes and this really hasn't been done before in that comprehensive manner that we have done. And so, there was this sort of first approach that we go in from here, trying to understand, okay, if we have information about control measures in a certain region, how effective are these measures, actually? And let me - this is a very good question but important also for future surveillance and guidance and control to understand - okay, if you put some measure in place at some point in geographic space, what does it actually mean and how can we contain the spread? But what we have sort of seen over the past years is that it's very hard to contain the spread of these mosquitoes, even in areas where we have quite good health systems in place. Previous Why do Scientists say "So"?